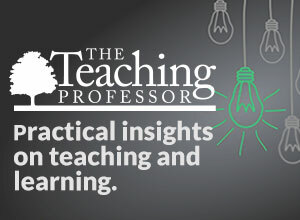 For more than 30 years, The Teaching Professor has been dedicated to supporting you in your lifelong work by providing keen insights and evidence-based practices from your colleagues at leading institutions from throughout the United States, Canada, and abroad. The content covers both face-to-face and online methods, so regardless of where you teach, The Teaching Professor will help you make informed decisions about your teaching practice. Each month members receive 12 articles on a variety of teaching and learning topics, plus one Magna 20-Minute Mentor program. Magna Publications offers a Bill Me (Pay Later) option for those customers who would like to allow for a purchase order number. To acquire a membership to The Teaching Professor via an invoice please contact Customer Service at support@magnapubs.com or call 800-433-0499, ext. 2 (outside the U.S. & Canada please call 608-246-3590 ext. 2). Our office hours are 8AM to 4:30PM Central Time, Monday through Friday.